After a year of battling with legacy issues, 2019 will be the year of evolution for Deja Vu Couture Carmel! Starting January, during the week so we may focus more on service, we will be a “buzz-in or by-appointment business” with extended weekend hours like the high-end European vintage shops. Setting us apart from thrift shops, we will create a “personal shopping haven” for our loyal regulars & for each new clients to keep up with the times… whether it’s full-service styling or freedom to play. This new time management will promote more closet cleanses, re-designs, and online sales to better expose our incredible designer-quality merchandise. Our evolution also requires an upgrade in systems. 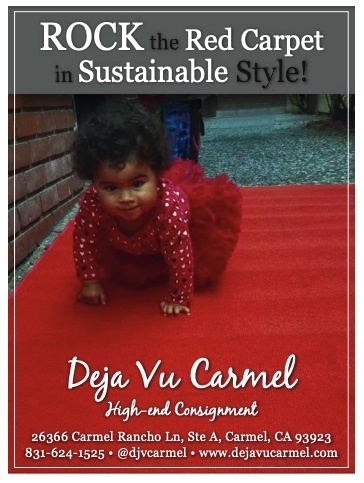 We are revamping our website, www.dejavucarmel.com, and developing a custom app for transparent access to inventory and consignment accounts. 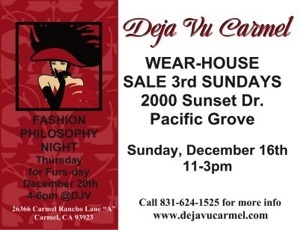 Remember to pop by the 3rd week of each month for “Fashion Philosophy Night” on Thursday and our Wear-house Estate Sale on Sunday. December is all about vintage fur! Stay warm with natural fibers, not electricity! Bring in your grandmother’s piece during our Thursday “fursday” event and learn ways to redesign, repurpose, and take care of them. We are so very grateful for the continued support and understanding from our community and are exhilarated to step into the abundant energy of 2019 with our inaugural wear-house anniversary on December 16th. Join us and let’s celebrate! See our ad in Camel Magazine- with Rosie!